And it was our pleasure to write about the designers and fabricators who made it all happen. We have so many favorites installations that we couldn't even narrow it down to a top five. From rustic to glam, these kitchens captured our hearts and inspired our own home renovations. When Chef Arnaud Marchand of Chez Boulay in Quebec set out to build a home kitchen for his young family, it needed to be warm, functional, dynamic and beautiful – and resonate with the scenic environment of the Canadian woods. And she was right. The natural variations were just what the chef wanted, and one reason he left his untreated. To learn more about how soapstone wears over time read this post. 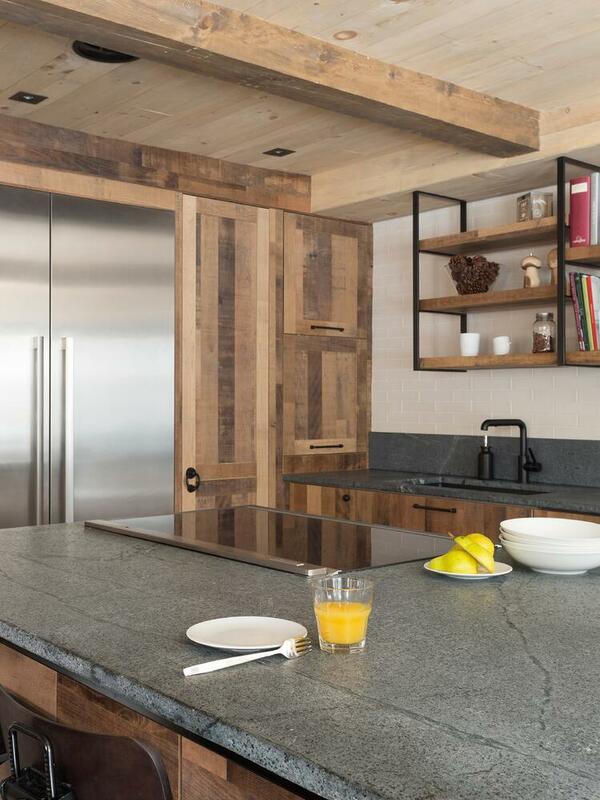 Get inspired for your soapstone kitchen design. Interior stylist, blogger and author of Simply Styling, Kirsten Grove, recently set out on a total renovation of a mid-century Idaho home she shares with her family. She and her husband do most of the work themselves adding character, ingenuity and style to every room with simple materials and a monochromatic pallette. 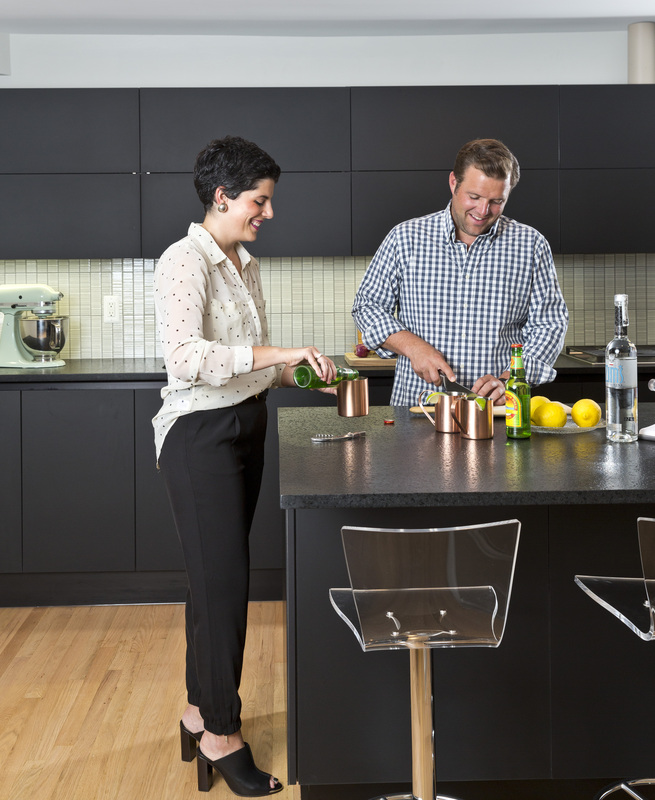 The matte black look of waxed Alberene Soapstone was her inspiration for the kitchen. "The colors and textures are just so intriguing to me," Grove said. "You just don't see the beauty of soapstone on a normal basis. I wanted people to walk in my kitchen and immediately be drawn to the textures. Other materials can be beautiful, but can also feel normal and dull. Soapstone is in a league of it's own." Grove highlighted the dramatic veining of the stone by waxing the surface of her counters and a waterfall feature. "Because my kitchen is opened up to both living rooms and dining room, I wanted to create a show stopping kitchen," she said. "The waterfall creates that gorgeous look! I chose my cabinet colors around the soapstone. I wanted a dark, moody kitchen. Because the walls are painted white, the space gets a lot of natural light, but the cabinets and counters give it that dramatic look that I wanted." The only truly black granite, we like to call Cambrian Black the Little Black Dress of the natural stone world. Polycor quarries it from it's own quarry located deep in Quebec, Canada’s countryside. Because the color of the stone is naturally black throughout (unlike Absolute Black or Black Galaxy it doesn't need a colored resin to enhance the color) it can be honed or brushed without turning grey. The honed surface lends a touchable quality to the surface that works in both traditional and modern interiors. This modern light-filled kitchen in the DC metro area features Cambrian Black Granite with honed finish complimenting the dark stained frameless cabinets. 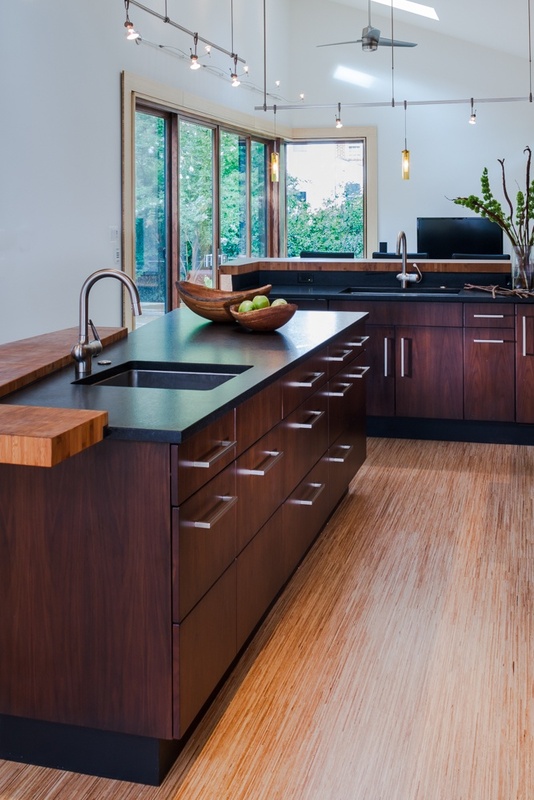 We love the warm quality of rich wood tones and varying grains paired with the deep black of granite - modern but not cold. Instead of a classic Italian white lacquered finish for her cabinets Serras chose matte black Scavolini cabinets, which are actually glass faced. The 3 mm glass face is applied to engineered wood, which allows for a frameless, super sleek look with no need for handles. See more of Serras' kitchen here. 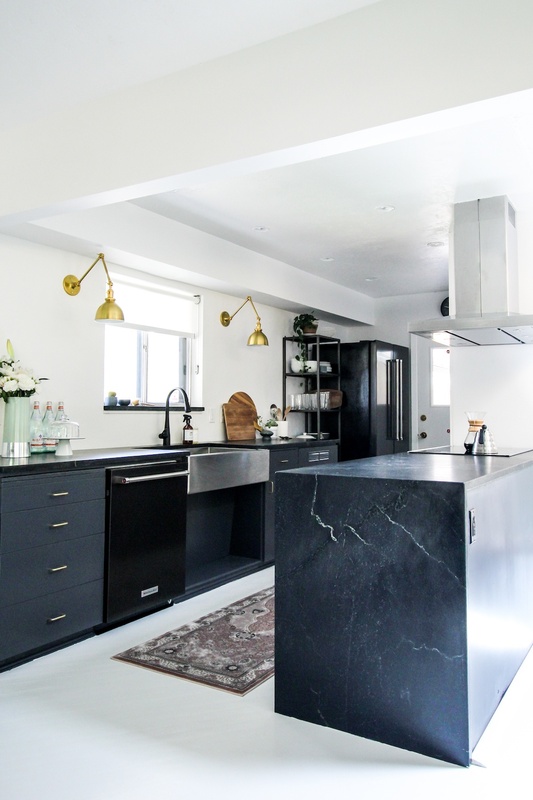 With cabinet swatch in hand she headed to her stone supplier Ciot, where Design Consultant Emilie Aubuchon introduced her to a completely different material - Cambrian Black granite in a leathered finish. Earlier this year Scavolini also collaborated with fashion house Diesel on a rustic lux kitchen model. See it here. Move around a Saint Henry Black granite kitchen and you’ll do a double take as you round the corner of the island to put your coffee cup in the sink. What looked like straight black from far off turns out to be black and grey opalescent mega crystals nestled within. This is a natural stone that doesn’t so much show off as it does reveals itself. With depth and interior movement, Saint Henry Black granite has a unique visual texture that interacts with your eye as you see it from different angles. The designer of this Quebec City kitchen made bold choices with bold materials, and yet they complement rather than compete. 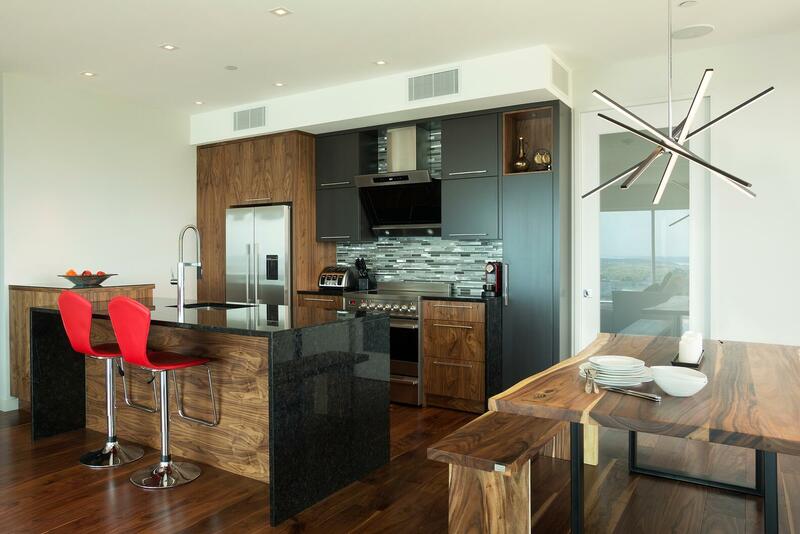 The bookmatched wood furniture and cabintery have a strong grain to stand up to the mega crystals of the St. Henry granite and the matte black cabinetry and steel table base provide relief. All granites polish well, but Saint Henry is able to achieve a higher degree of polish than most and rates at a higher luster than other natural stones. It has an inner luminosity. When the light hits it, it almost looks like abalone. 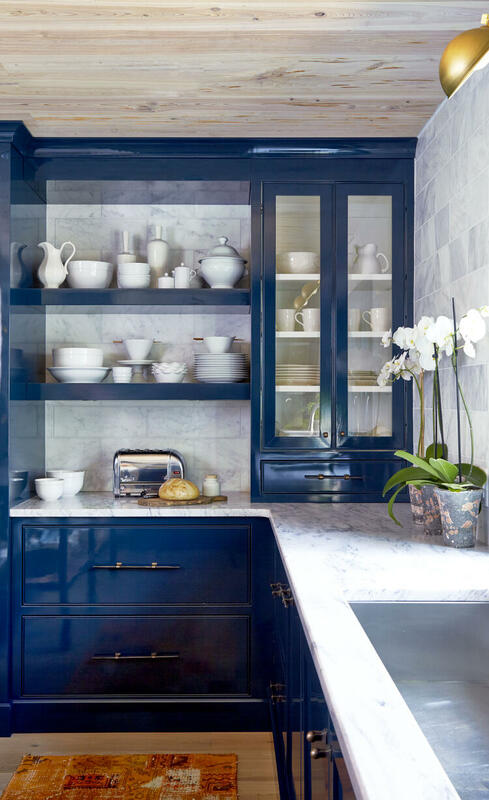 Sessions likes to use her own home as a design lab and one of her most striking experiments is in the kitchen where she paired lacquered teal cabinetry and Georgia Marble on the island and countertops, a stone that Session has always wanted to work with. See more of the American marble kitchen here. This year we saw more designers, like Sessions, challenge the myths around marble's durability and spec this enduring stone for busy family kitchens. You can see how marble compares to quartz here. For more on how to care for marble to keep it beautiful for a lifetime, download our marble care guide.